April 29, 2013, 7 am. A uniquely shaped plane takes off in the Mojave Desert in California. Richard Branson, founder of Virgin Galactic, has been waiting for this morning for a long time. SpaceShipTwo, the spacecraft built by his company for the purpose of bringing tourists to space, is about to perform its first supersonic test flight. The Virgin Galactic approach to space travel is an interesting one. A plane carries a spaceship smoothly up to 40,000 feet before it is released. Once released, rockets ignite, enabling the ship to finish the ascent into outer space on its own. A very clever way to provide humans present in the ship with a more seamless experience than the brutal take-offs of traditional rockets. At 46,000 feet SpaceShipTwo is released. 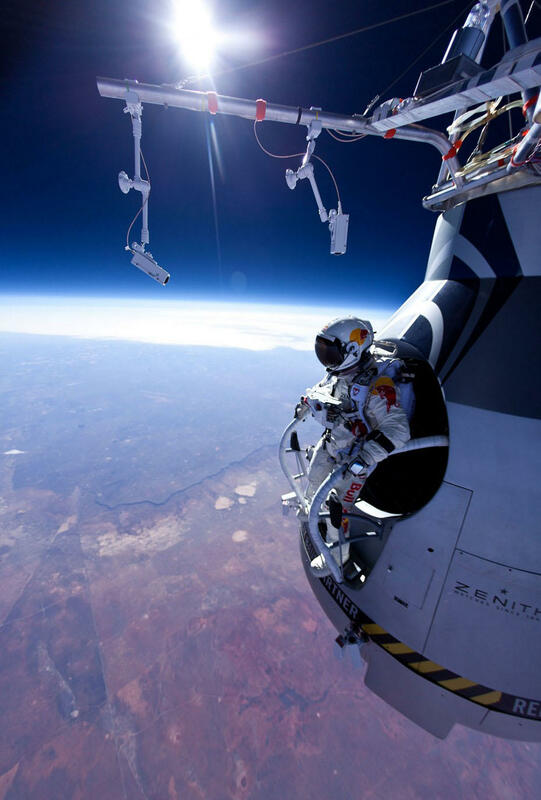 Its engine starts… 16 seconds, 56,000 feet up in the air. The test-flight was a success. April 29, 2013 will be remembered as the day a new era began for the human race. It’s the day space tourism has become a certainty. Even if the program won’t open to the public until 2015, we know that it will now be possible to bring non-astronauts to space. Beyond the technological feat, Virgin Galactic has started a new movement that I believe will change humanity’s mindset. Here’s why. The Overview Effect is the humility and perspective felt by astronauts when seeing our planet from space. “When a person gazes upon Earth from outer space,” explains Alex Maccaw, “they have a profound sense of perspective, a realization of fragility, that humanity and all life as we know it is completely dependent on a single planet and its thin atmosphere.” You don’t need to go really far to feel it: Felix Baumgartner, the man who brought sky-diving to another level by jumping from 127,000 feet, felt the Overview Effect when standing outside of the shuttle, ready to fall. Most astronauts who were lucky enough to travel to space came back with a new perspective of the world, a more humble and tolerant vision of their existence. Going 100,000 feet high remained a challenge until now. But companies such as SpaceX and Virgin Galactic are on the edge of democratizing space travel. In a near future, gazing earth from 100,000 feet high or more will be something we could all do. “Why is that important for the human race again?,” you might ask. Today only a handful of human-beings have experienced the Overview Effect, but imagine the consequences if thousands, or millions of humans went through the same experience. We would be all more peaceful, more tolerant and more focused on progress. Although I might sound a bit idealistic, I base my analysis on two things: human history and neurons. First, the historical explanation. You can observe an interesting correlation between tolerance and technology in our history: the more advanced technology becomes, the more open-minded humans get. Technological innovations increase our visible universe and the amount of information available to us. Logically, the more information we get, the more likely we’ll run into a piece of information in conflict with what we know and believe in. For example, if you were born in a small village and spent all your life there, the people and things surrounding you would probably remain perfectly in line with your beliefs and values. But if you took a plane and visited Rwanda or Mongolia, you would get to meet people who have completely different views of the world, things and landscapes that you never thought existed. Throughout history, technological innovations have made us more tolerant by exposing us to new worlds, values and beliefs. Now comes the scientific explanation: Being exposed to values and beliefs that are not in line with our owns create cerebral conflicts. Cerebral conflicts are not nice to experience – nobody likes to be told they’re wrong – so our brain will choose between two behaviors to resolve the conflict: denial or acceptance. The easy way is usually denial, but denying the existence of an idea can be challenging when constantly reminded through multiple communication channels. Technological innovations make it harder and harder for us to ignore opposite values and beliefs, thereby forcing our brains to resolve cerebral conflicts by choosing acceptance. If the topic is of interest to you and if you have 20 minutes to spare, I highly recommend to watch God is in The Neurons. This video will tell you everything you need to know about cerebral conflicts, identity and tolerance. The same way planes and boats have enabled us to travel the world and discover new cultures, the same way the internet has enabled us to be connected to anyone, anywhere, and challenge our beliefs and values, space travel will bring the human mindset to the next level, making us more humble, more tolerant and more focused on important things. April 29, 2013 was the day humanity made another step towards tolerance and peace. Yet this is just the beginning. Soon we will be able to travel from London to Sydney in 4 hours or even go to Mars! It takes thousands of visionaries and entrepreneurs to build those technological innovations, and I’d like to thank all of them for their brilliant leadership and courage. Thank you for making us better humans. June 20, 2010, 9 pm. I’m on my way back to Paris after a long weekend in the south of France. My friend Charlotte and I have booked tickets for a night train that will bring us back at around 7 am. The train isn’t a standard train: it has a night club in it. One of the wagons has a bar and a dance floor where you can party until the early morning. We had never done this before and thought it could be an epic adventure! We decide to go look for the night club wagon as soon as we get in the train. We are a little disappointed to find it almost empty, but we stay and order drinks. Shortly after our arrival, people join and we start talking to them. It’s a group of USC students coming from Los Angeles and doing a 6 weeks Europe tour as part of their program. One of them is called Josh. Josh is a smart young man, very nice and interesting to talk to. We decide to exchange our contact details and to get a coffee in Paris before the group goes back to the US. A week later, Josh and I meet up at a Café in Paris. We talk about our passions, life, relationships, science, technology and I tell him about my desire to learn how to develop websites and to create my own. I live in France and he is in California so it’s unlikely that we see each other again but we promise to stay in touch. Not only is Josh one of the smartest men I’ve ever met, he also has a heart the size of the Moon. On top of securing my domain name, he also offered to host my website. Of course, I insisted to build it myself (and with the help of WordPress) in order to learn PHP and CSS, but he did everything else. It took me a year to decide what I wanted to do with this website. In August 2011, I was set about the content and the general design, so I started. After weeks of coding, solving bugs, creating other bugs, and solving more bugs still, I finally pushed dorianemouret.com live in October 2011, thanks to Josh. Josh’s stellar intellect has led him to become one of the select few engineers working on the Dragon ship developed by SpaceX. 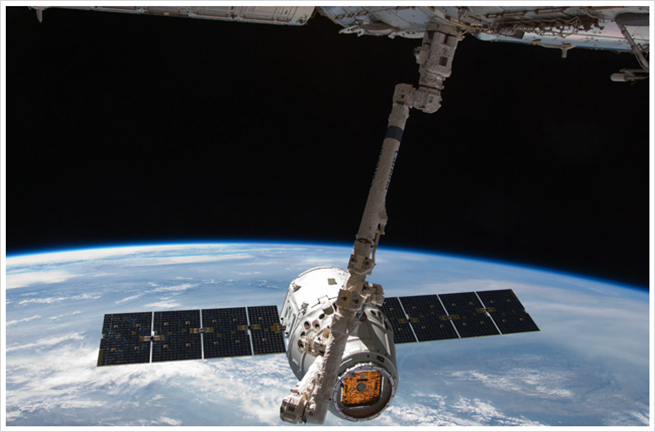 Founded in 2002 and having recently completed it’s first successful mission, SpaceX will soon become the first private company to be contracted by NASA for the management of routine tasks in low-Earth orbit. Yes, Josh sends spacecrafts in the universe, and is also one of my closest friends. 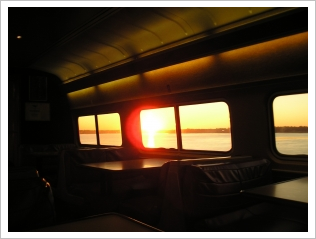 What would have happened if I had opted to sleep on the train that night and keep myself in my own little box? Would this site exist? The answers, we may never know, but what I can tell you for certain is that you will never regret thinking outside the box. So get out there, be open to new experiences, meet new people, think out of the box and who knows? Maybe one day you’ll run into a person that will change your life. If someone had told me when I walked onto that train 2 years ago that I was about to randomly meet a man who would not only inspire me by his career path, but also become a friend and help to make my dream come true, I wouldn’t have believed it. Yet it happened. Out of the box. You can follow Josh on Twitter, see his profile on LinkedIn or visit the website of his company SpaceX to learn more about commercial space travel. Being an Hacker News addict, I read more and more articles complaining about this privacy intrusion Google is leading. The reason why all these articles only focus on Google is simple: Google services have become so massive that they are now considered as a primary need in our lives. What if you were asked to disclose your marital status, political opinions, and the names of the 10 last places you visited every time you took your car to go to work? That’s what I thought… Using Google is like driving your car. Yet, what Google is doing is part of a bigger movement that is called the Monetization of Privacy. In short, the monetization of privacy happens when a company offers a service for free to its users in exchange of the exploitation of their personal data. By default, companies can’t share your data with other companies, but they can do whatever they want internally, and are totally allowed to share general statistics externally. Tons of organizations are currently using this model, including Facebook, Pinterest, Foursquare, Path, Instagram, Yelp, Zynga, among others. To understand this movement better, let’s get back to how it was before, and how we got here. Cost of production, which includes the value of raw materials needed to produce the item, the cost to transform them, the cost of labor force, etc. Rarity, which is the relation between offer and demand of a certain product. That’s how we know that if Justin Bieber would decide to sell one of the t-shirts he’s worn, he could probably make several thousand dollars. The cost of production of the t-shirt wouldn’t exceed $20, but the rarity of the product – only one t-shirt worn by Bieber, and millions of hysterical fans ready to buy it and wear it until it’s tattered – makes it extremely rare, hence highly valuable. That is also how we measure the value of money. Money is highly valuable to us because it’s expensive to produce – we need to work hard to get salaries that we always find too low – and really rare – well, except for Carlos Slim and Bill Gates. Thus, money has a high perceived value, and we don’t give it away that easily. However, we don’t really care about information. Information is very cheap to produce thanks to new technologies, and is far from being rare. It is actually so massively occupying our lives that we need to create tools to filter it. So when companies such as Google came to us and asked us to give away our information instead of our money to get the same product other companies were making us pay for, we jumped on the opportunity! Yes, please! Take all the information you want, it’s cheap! Well… we failed. And here is why. 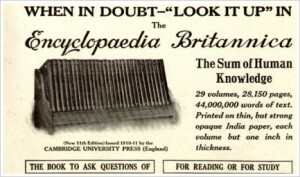 On March 13, 2012, Encyclopedia Britannica announced that the company would discontinue the printed editions of its centenary volumes. The encyclopedias don’t sell anymore because costumers estimate that the value of those books is not worth the price asked to buy them. They also know that they can find as relevant and probably more recent information faster and easier on Wikipedia. Paying newspapers such as The New York Times also see their revenues drop in 2012. I don’t think you need more examples to see where I am going: information is everywhere and is so easy and cheap to produce that people are not ready to buy it anymore. And the behavior they have with external information is the same they adopt for personal information: no value, might as well give it away. But our way to estimate the value of information is mistaken. The take away of my article is here: just forget the traditional valuation model. The value of information doesn’t depend on how many resources it takes to produce it, or how rare it is. The value of information is measured by the benefit you can take away from it. Don’t think income, think outcome. And it changes everything. Pinterest has in its database millions of pictures. Among them, a lot are fashion pictures posted by women. Do you imagine the value of knowing what are the biggest fashion hits, and being able to segment it by ages, geography, type, for a company such as H&M? It can give H&M the possibility to produce items that are better adapted to their highest potential buyers, hence make more money and increase customer satisfaction and loyalty. I know what some of you are going to say: It’s a win-win situation. The company makes more money, and we end up with products that are more adapted to us. And I totally agree. The problem is when we don’t have any choice anymore. Companies want to get our personal information in exchange of their services? Fine, but if we don’t agree, we should be able to opt out and replace our personal data by cold hard cash. Being tracked should be a choice, not something forced, and Google is not necessarily taking the best approach right now. What if I want to pay to watch a YouTube video without disclosing my Google+ profile? I can’t. Consider another concrete example: Paul Graham recently mentioned the good old days of Google Search and how the invasion of privacy had corrupted the results of our searches: “Google used to give me a page of the right answers, fast, with no clutter,” explains Graham. “Now the results seem inspired by the Scientologist principle that what’s true is what’s true for you.” Tracking biases our online user experience, replacing a universal common knowledge by individual results that are supposed to “suit” us better. Don’t get me wrong: I do see the benefits of online tracking and targeted advertisements – I work in marketing, after all. However, when online tracking becomes standard and there is no way to opt out, it becomes dangerous as it gives endless power to the company that owns your data. For instance, you can end up in the situation where a company announces to your father that you are pregnant before you got the chance to tell him anything. Microsoft didn’t waste any time figuring out Google’s new weakness and already created a video that says it all: Yes, Office 365 is not free, but at least it doesn’t read your emails. The Monetization of Privacy is a growing movement, and is already becoming the standard for tech companies. In my opinion, monetizing our privacy should be something that we decide to do. The option to opt out and pay should be mandatory and available to everyone who cares about their privacy. However, I’m part of the minority: According to a report published by the European Network and Information Security Agency, only 1 on 3 web users consider paying an online service to protect their privacy. And you, what do you think? Would you rather pay to protect your data? Or are you fine with having companies owning your personal information? In any marketing strategy, “being the first” is crucial in order to have your campaign stand out. Dropbox is a great example of a company that took advantage of both its position as a pioneer in the market of consumer cloud storage and the absence of potential competitors to get consumers’ attention. Beyond having a great product, Dropbox took the initiative to implement a social media strategy that had rarely been tried before – it was between 2007 and 2009. A Community without a Product. The first innovation tried by Dropbox founders Drew Houston and Arash Ferdowsi was to build a community before the product was actually released. While many companies wait to have a fully launched and market-ready product before rallying their core users, Drew and Arash tested landing pages and a private beta program with early adopters that became their main evangelists afterwards. A Video promoted on an Aggregator. 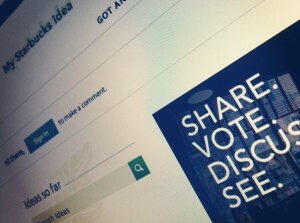 The second brilliant idea released by the company co-founders happened when they launched their viral marketing video. No, I agree, creating a marketing video was not innovative, even in 2009. But the innovation came through the way they decided to share it: they launched a campaign on Digg, a website usually used to bookmark articles. 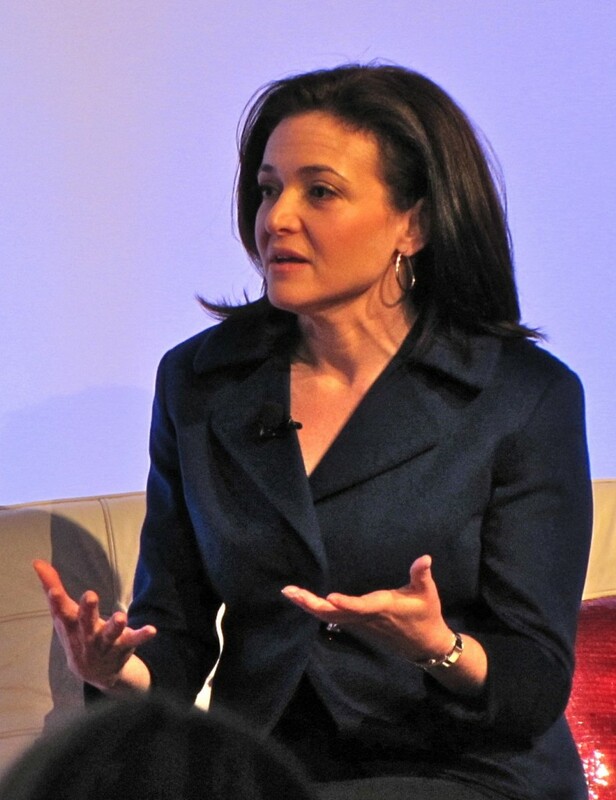 “At the time, Dropbox was closed. After the video went viral, our beta waiting list went from 5,000 people to 75,000 in a few hours,” Drew explained. 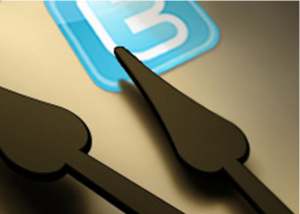 Thus, using an innovative social media strategy can be highly beneficial to your business. 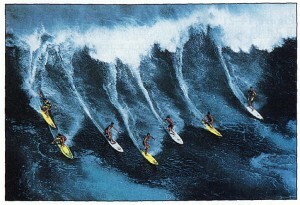 The downside comes with the risk taken to implement that strategy. Indeed, if Dropbox hadn’t satisfied their early adopters, they were taking the risk of spreading a negative image of their product among a group of people highly influential in the industry. When sharing content, these risks usually show when you transcribe unheard or unpopular opinions on your blog. Bloggers who think “out of the box” take the risk of being damned by the community, or even ignored. But if their ideas are relevant and founded, they could also become strong thought leaders. 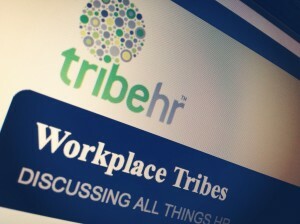 When blogging for a company, this risk is transferred to the organization. Thus, if your ideas fail at rallying the general opinion, you can damage your brand irreversibly. However, if it works, you will place your company in a strong position for the future. Marriott on the Move. In my third article, I explained how letting the CEO of a company be the main writer could have bad consequences on a blog strategy. 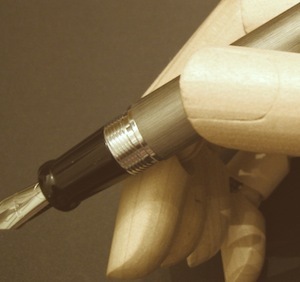 Not only does it make your company rely on the CEO’s image, but it can also harm your brand if the CEO is not a good writer. 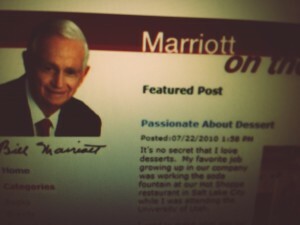 Those details didn’t stop the hotel chain Marriott International whose blog “Marriott on the move” is written by Mr. Bill Marriott himself. And it works! Each article receives between 10 to 20 comments in average, showing a community of engaged readers that take time to share ideas and leave long comments. On the go with Amy. Hiring a social media expert or a full-time blogger to create your corporate blog content was another main point of my third post. I highly dissuade to externalize your content development to someone that doesn’t belong to your company. The external blogger doesn’t come to the office everyday, therefore isn’t involved in the company culture and can miss some important changes in the company strategy. And there is nothing worse than a blog saying something that doesn’t align with your strategy. Best Western decided to try nonetheless by giving control of their corporate blog to Amy Graff, a long time fan – but not employee – of the company. In “On the go with Amy“, Amy talks about her travel experiences with her family, which drives a high level of engagement. The Old New Things. In my first article, I explained how defining a relevant strategy when building your blog was crucial in order to make the most of it for your company, hence driving sales. I recommended to focus on creating relevant content for your readers, but also gave you tricks to incorporate your brands and your products in that content. That’s indeed a safe strategy to make sure your executives and investors see how your corporate blog can bring value to the company. Well, The Old New Thing doesn’t do that at all. 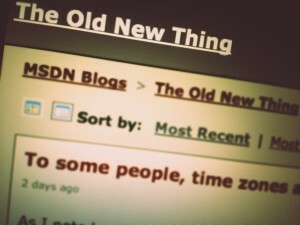 The Old New Thing is an MSDN blog written by Raymond Chen, Principal Software Design Engineer at Microsoft. Raymond only shares his expertise and honest opinion in his posts, without promoting or linking to any Microsoft websites. It’s true, it’s sincere, and it works. No strategy, just good honest content. Nuts About SouthWest. I really appreciate blogs such a the LinkedIn blog, with a clear, simple and seamless design. As I stated in my fourth article, simplicity enables faster page loading, and keeps your reader focused on the content. The airline company SoutWest doesn’t seem to worry too much about that, and decided to build one of the heaviest blogs I have ever seen: tons of images and videos everywhere, and a minimum of 10 calls-to-action on any given page. 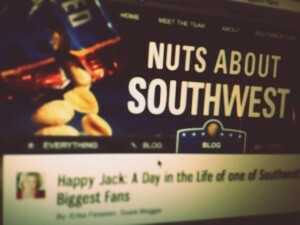 Some would think that this blog is far from offering a seamless user experience, but it’s an opinion that the recurring visitors and fans of Nuts About SouthWest don’t seem to share. 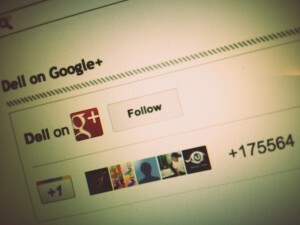 Dell on Google+. When starting a blog, it’s essential to build an entire social media strategy around it in order to optimize your exposure. The common plan is usually to build a Facebook fan page, create a Twitter handle and encourage the visitors of your corporate blog to “Like you on Facebook” and “Follow you on Twitter”. Well, forget that! Facebook and Twitter are so 2011! Dell decided to bet on the next trendy social network: Google+. The Direct2Dell blog doesn’t feature any Facebook page, and Twitter only gets some attention at the bottom of the page, while Google+ gets to have a prominent window at the top. Going “all in” on Google+ is bold, and Direct2Dell could be missing out some interesting Facebook traction as a result, but if Google+ becomes the next big thing in 2012, it will give the company a significant competitive advantage in terms of social media strategy. [UPDATE 05/08/2012] The Direct2Dell blog doesn’t highlight its Google+ page anymore: It was probably a temporary campaign to increase the number of followers on Google+. According to a study conducted by HubSpot, companies that blog get 55% more traffic. But the study doesn’t mention all the work required apart from just building a blog platform in order to get this extra traffic. During this 5 article series, I tried to highlight the different aspects of building a corporate blog, and I hope I convinced some of you to think twice about your blog strategy. Now it’s time for you to choose. If you follow the recommendations given in the first 4 articles, your corporate blog will bring you interesting results, but you will never make your company a rock-star in the corporate blogging world. If you decide to be innovative and follow the advice of the fifth article, you take the risk of making your blog strategy fail, but you also open the door to new opportunities for success. Your turn: so what do you choose? Corporate blogs that have this level of expertise are hard to differentiate from each other. The blog strategy has been built and implemented to its maximum, and it’s now time to focus on another factor that is not proper to corporate blogging: user experience. Most people associate “user experience” to beautiful design. 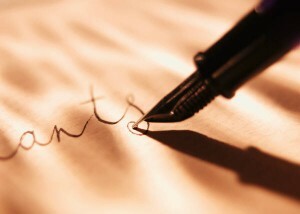 In fact, UX implies much more parameters, especially when it comes to blogging. 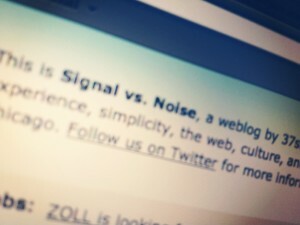 Thus, an excellent user experience on a corporate blog starts with a good timing. 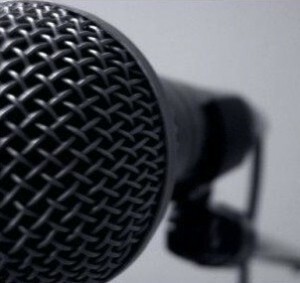 Leave your content alone, question your timing. When a blog doesn’t get the attention expected, the reflex is to think the topics tackled are not aligned with the readers’ interests and that changing them will solve the problem. Yet, when the blog strategy has been built carefully, content is rarely the issue and changing it would actually make it worse. There is another factor you can question when trying to improve your blog performance: timing. In a recent study, KISSmetrics highlighted the importance of publishing your content at certain times of the week in order to get maximum exposure. For instance, it is crucial to define where your current and potential customers are and gear your social media publishing toward them. Commit to your blog, like, really. Many blogs are put aside of global corporate marketing strategies after 6 months because of a lack of immediate results. It is a mistake as most of them are actually about to give their first results at that particular time. It is essential not only to perceive your social media strategy as a long-term challenge, but also to commit to it. 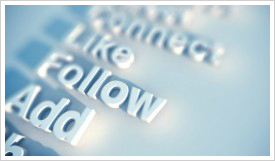 Frequent posting on your blog will drastically accelerate the efficacy of your blog. As mentioned in the KISSmetrics study, the more articles are published on a blog, the more visits it gets, the greater the chances are to increase visitor’s engagement and start the virtuous circle. Be Catchy.The current battle to win the SEO war sometimes makes companies forget the necessity of creating catchy titles in their blog. Yes, making sure your titles have all your keywords will definitely improve your SEO, but could also make all your potential readers dismiss your article because it didn’t catch their attention. That’s what happened to The New York Times recently. The newspaper published a very interesting story, but got a significant part of its traffic stolen by Forbes. How so? Because Forbes, even if publishing a similar story, used a more catchy title. 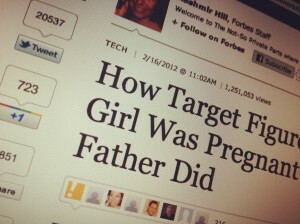 As Nick O’Neill explained on his blog, while the New York Times had named its article “How Companies Learn Your Secret“, Forbes titled it “How Target Figured Out A Teen Girl Was Pregnant Before Her Father Did“. Now you get it, right? Being dramatic usually works very well. Keep it simple. The rules that apply to a blog design are similar to the ones we use for websites in general. I am not an expert and won’t pretend to give you any design lesson. However, there is one thing I suggest to take into account: not everybody has the last generation of Mac Book Pro running the most powerful graphic card ever – well I don’t. Thus, I’d recommend to keep your design simple and limit the number of images in order to accelerate the loading time of your blog. A page that you can load in less than 2 seconds on your personal computer can take 10 seconds on another computer, and hence ruin the user experience. And here we are! If you did follow the different pieces of advice provided in the first 4 articles of this series, then you now have the perfect corporate blog! Yes, I know what you are thinking: It’s a “5 reasons why” series and we only went through 4 reasons so far, so how can it be perfect? Well, this is when I get to use my favorite words and ask you to think out of the box. A good strategy, messaging, tone and user experience will enable you to build a strong returning audience, and probably be amongst the top corporate blogs in your industry. But it might be long. To be under the spotlight and rapidly catch the attention of not only your targeted audience, but the general online population, you’ll need to take some risks and be more innovative. Last episode next week! And don’t forget to subscribe to my RSS to be the first to find out!